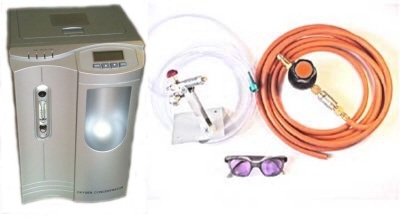 This kit will include a new 5ltr oxygen concentrator. These now come with a 2 year guarantee as well as offering higher oxygen purity and a cleaner burning flame which makes your colours keep their sparkle. We have removed the U.K propane gas regulator as it might not fit some European propane cylinders and you can fit your own from a stockist near to you.We have still included the flashback arrestor as a safety device and reduced the price accordingly.